Any mattress can be made in non-standard shape (round or oval mattress) or sizes, as well as with a wooden frame. Comfortable universal mattress with features of both medium firm and soft mattress. The natural coconut fibre plate from one side increases its firmness and elasticity, while the 3 cm latex layer ensures softness from the other side. The porous surface of the latex "Clima Convulted" guarantees perfect softness, ensuring excellent comfort. Thus the proper spinal support is provided by changing the sides of the mattress. The independent spring block Pocket Spring ensures correct and even load distribution, increasing the quality of orthopaedic features. Double-sided Winter/Summer mattress. Mattress for those who prefer rather firm sleeping surface. 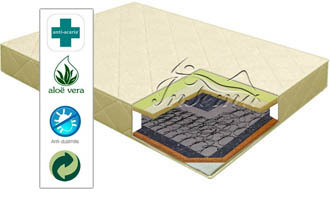 Natural coir filling increases the firmness and elasticity of the mattress and provides better ventilation. The independent spring block Pocket Spring ensures correct and even load distribution, increasing the quality of orthopaedic features. Double-sided Winter/Summer mattress. Mattress for those who prefer medium firm sleeping surface. The natural coconut fibre plate from one side increases the firmness, while the sea grass layer provides additional elasticity, orthopaedic effect and convenience for comfort and relaxation. "Sea grass" controls and ensures the balance of humidity and temperatures, and prevents electrostatic charge generation which affects overheating, high humidity level and discomfort. The independent spring block Pocket Spring ensures correct and even load distribution, increasing the quality of orthopaedic features. Double-sided Winter/Summer mattress. TFK Relax combines features of both soft and medium soft mattress. The natural coconut fibre plate from one side increases its firmness and elasticity, while the 3 cm latex layer ensures softness of the surface. The porous surface of the latex "Clima Convulted" guarantees perfect softness, ensuring excellent comfort. The independent spring block Pocket Spring ensures correct and even load distribution, increasing the quality of orthopaedic features. Double-sided Winter/Summer mattress. Soft orthopaedic mattress with the independent spring block Pocket Spring and high-quality orthopaedic features to provide even and correct body support during the sleep. In addition, the quality is ensured by natural latex – flexible and resistant to shape change. The mattress is suitable for those who prefer comfort and soft sleeping surface. Double-sided Winter/Summer mattress. 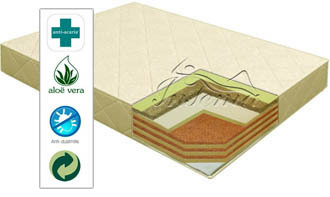 Soft non-spring mattress with high-quality orthopaedic features obtained by using high-quality natural latex. Air channels in the latex layer provide good ventilation and optimal temperatures. 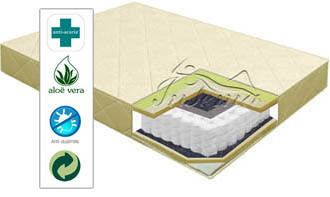 This mattress model “breathes” and has high elasticity and durability values. The high latex elasticity ensures right sleeping position supporting the spine correctly. 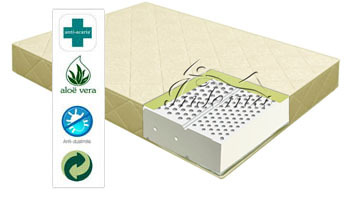 This mattress is irreplaceable if comfort and convenience or special careful support is needed while sleeping, for instance in cases of trauma casualty, rehabilitation or physical recovery and therapy etc. This mattress model is recommended for lower back pain sufferers. Double-sided Winter/Summer mattress. 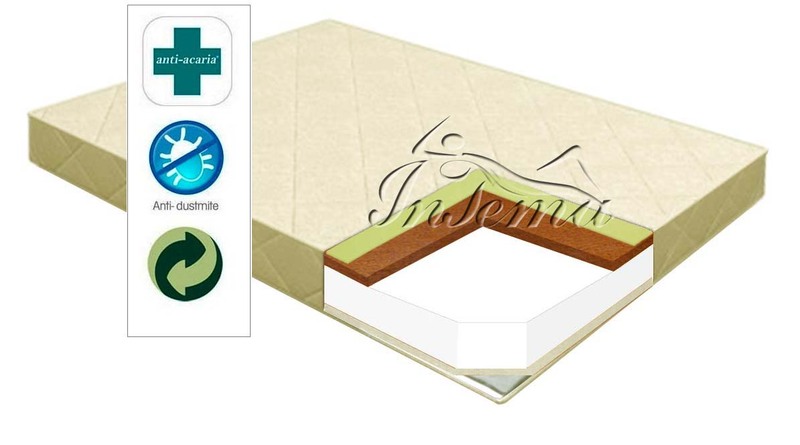 Strong, moderate firm non-spring mattress with high-quality orthopedic features obtained by using high-quality latex. Air channels in the latex layer provide good ventilation and optimal temperatures. This mattress model “breathes” and has high elasticity and durability values. The high latex elasticity ensures right sleeping position supporting the spine correctly. Double-sided Winter/Summer mattress. Medium firm non-spring mattress with high-quality orthopaedic features. 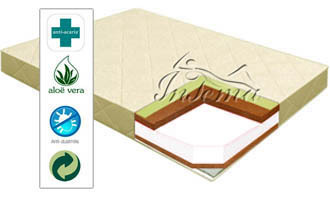 Its firmness and hardness is intensified by the coir (coconut fibre) layer in addition to qualitative zone latex layer. The porous surface of the latex "Clima Convulted" guarantees perfect softness, ensuring excellent comfort. It provides even distribution of air flow and unique massage effect. Air channels in the latex layer and the high air circulation of the natural coir provide good ventilation and optimal temperatures. Double-sided Winter/Summer mattress. Universal non-spring mattress with high-quality orthopaedic features. It consists of several layers from different materials – latex, HR orto-foam and latexed coconut plates. Air channels in the latex layer and the high air circulation of the natural coir provide good ventilation and optimal temperatures. The porous surface of the latex "Clima Convulted" guarantees perfect softness, ensuring excellent comfort. This mattress model is very durable and efficient. To change the firmness of the mattress, it is enough to turn its other side. The mattress is suitable for all weights and ages. Double-sided Winter/Summer mattress. Comfortable springless mattress with features of both firm and medium soft mattress. 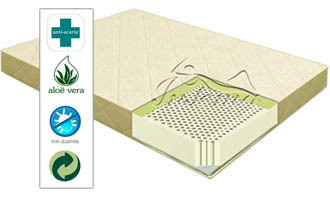 Natural coir filling from the one side of mattress increases the firmness and elasticity and provides better ventilation. From the other side of mattress latex layer ensures softness. HR cold foam base provides additional elasticity, orthopaedic effect and convenience for comfort and relaxation. High resiliency is the ability of foam to bounce back after being compressed. One of the best properties of HR foam is its long-term strength. HR foam is non-allergenic. It is both dust and mildew resistant, greatly reducing the potential problems faced by those with allergies. Double-sided Winter/Summer mattress. Extra firm springless mattress. 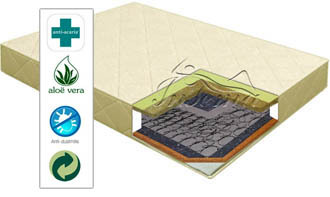 Natural coir filling increases the firmness and elasticity of the mattress and provides better ventilation. High resiliency is the ability of foam to bounce back after being compressed. One of the best properties of HR foam is its long-term strength. HR foam is non-allergenic. It is both dust and mildew resistant, greatly reducing the potential problems faced by those with allergies. Double-sided Winter/Summer mattress. Mattress for those who prefer rather medium firm sleeping surface. Natural coir filling increases the firmness and elasticity of the mattress and provides better ventilation. The classic spring block Bonnell is mounted in mattress pad around the perimeter upon the polyurethane foam frame which allows the mattress to resist shape changes. This mattress model is recommended for upper back pain sufferers. Double-sided Winter/Summer mattress. Mattress for those who prefer medium firm sleeping surface. 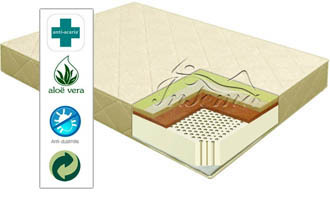 Serenity combines features of both firm and medium firm mattress. The natural coconut fibre plate from one side increases the firmness, while the sea grass layer provides additional elasticity, orthopaedic effect and convenience for comfort and relaxation. "Sea grass" controls and ensures the balance of humidity and temperatures, and prevents electrostatic charge generation which affects overheating, high humidity level and discomfort. The classic spring block Bonnell is mounted in mattress pad around the perimeter upon the polyurethane foam frame which allows the mattress to resist shape changes. This mattress model is recommended for upper back pain sufferers. Double-sided Winter/Summer mattress. Comfortable universal mattress with features of both medium firm and soft mattress. The natural coconut fibre plate from one side increases its firmness and elasticity, while the 3 cm latex layer ensures softness from the other side. The model is not symmetrical thus providing to choose proper levels of firmness and elasticity. The classic spring block Bonnell is mounted in mattress pad around the perimeter upon the polyurethane foam frame which allows the mattress to resist shape changes. Double-sided Winter/Summer mattress.